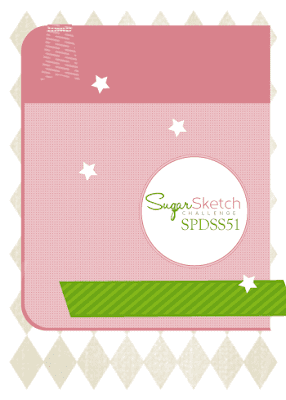 Hi and welcome to a new sketch at SugarPea Designs. I started with a Desert Storm card base and onto that I adhered some really old SU patterned paper. The onesie was stamped and die-cut using Welcome Baby and Welcome Baby Accents. 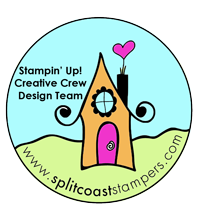 The blocks were cut by hand after stamping onto matching SU cardstock. 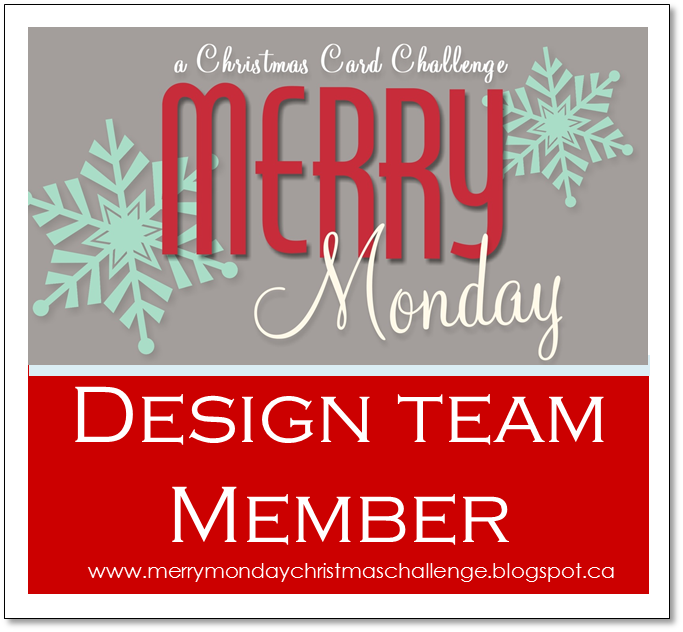 I finished the card with some candy dots. Upload to your blog or other Online Gallery using Keyword: SPDSS51 so that we may check out your beautiful work. 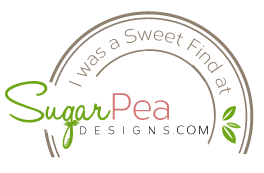 One randomly selected winner will receive a $25 Gift Certificate to the SugarPea Designs store. 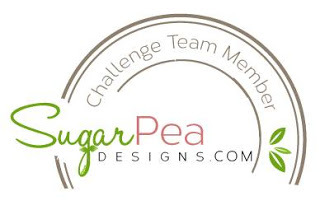 However, if the winning entry features a SugarPea Designs stamp we will increase the prize to $75! Kerrin, SUPER sweet!!!! 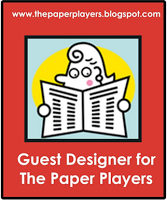 Thanks so much for having me as April's Guest Designer, so much FUN and great inspiration!!!! how sweet, karren!! 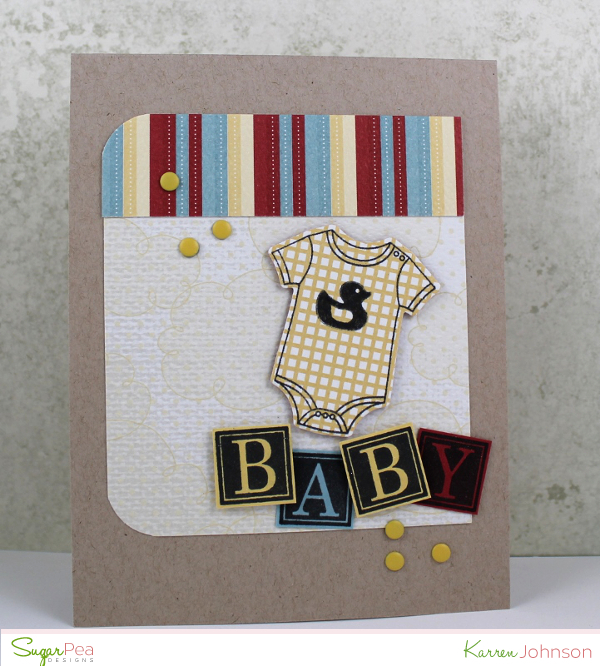 a perfect gender neutral baby card! Oh, I love that you've worked with colours other than the normal pastels for a baby card, Karren - this is just perfect for a boy or a girl!!!! That is such a cute little onesie with the sweet duckling and the baby blocks are such a clever idea to add the 'Baby'!!!! I really like the colour of the card base!!! Such a wonderful baby card - I really like it a LOT!!!! 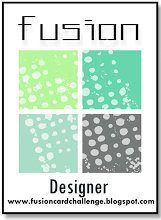 You always come up with the cleanest of designs, regardless of the sketch, Karren! This is fantastic! So Sweet - love the colours!! !